has published a flagship report on systems thinking, sponsored a supplement on the topic in Health Policy and Planning, as well as other activities. 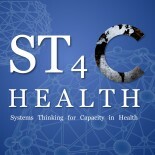 a consortium of institutes that approaches global health from a complex, adaptive systems perspective. an international trans-disciplinary network of expert groups and institutions working towards the convergence of complex systems analysis and health systems policy and planning. a learning and practice network that applys complex systems analysis to sustainable human development activities. aims to foster the health of individuals, families, communities, organizations and our natural environment by helping people use concepts emerging from the new science of complexity. a catalyst to promote new ways of thinking and innovative solutions to address the complex and growing challenges of our health system.